Choosing to host a Thanksgiving wedding can be a tricky task! After all, it is a major holiday and people take their holidays very seriously; especially Thanksgiving. While it is still important that you and your fiance have the wedding that you dream of, you also have to be extra mindful of your guests when planning your wedding details. Your family and friends are very excited to spend the day sharing in the union of your marriage but they are also forgoing their holiday plans to do so. If you keep in mind some of these Thanksgiving wedding tips, your guests will appreciate the extra mile you went to make them feel at home away from their home on this holiday weekend! Be sure to send out save the dates well in advance so your guests can alter their holiday plans to share your day with you! Consider estate tables for your guests seating rather than round or square tables. This will give your dinner service a more of a feast/family style setting! It’s Thanksgiving so why not provide a feast for your guests? A beautiful apple cider sangria signature drink, mini pies or a pie bar and of course…Turkey and Ham! 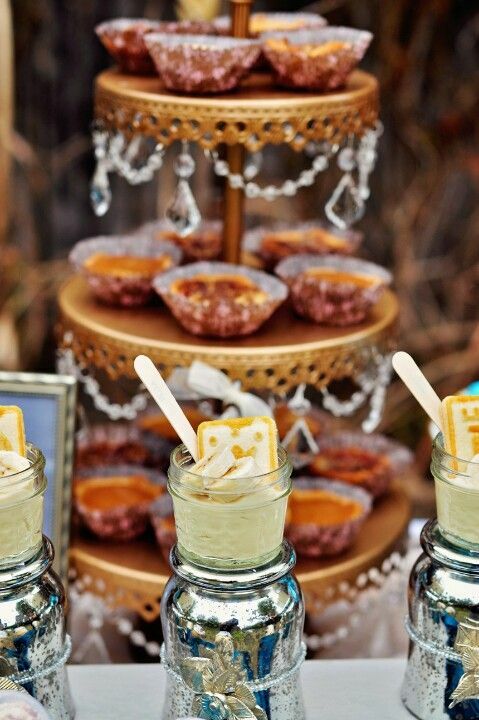 You can’t go wrong with these yummy delectables to remind you and your guests of the holidays! Take advantage of the world around you! Save money by using beautiful, traditional Thanksgiving food to amp up your decor without running up the bill! Pomegranate, cranberries, artichokes and of course pumpkins are all money saving tricks that you can find at your local market…AND it brings in color! Leave your guests with a lasting wedding favor by donating to a charity or helping the less fortunate in lieu of traditional wedding favors. Especially during the holidays, it is a great way to give thanks for the blessings that you have that others may not. Your guests will not mind at all if that bag of chocolate is absent! Have a safe, warm and Happy Thanksgiving from our family to yours!